Rajmahal Hemp is a robust lianas, densely hairy to velvety throughout except for the upper surface of petals. Leaf-stalks are 5-6 cm, slender; leaves ovate, 8-10 x 6-6.5 cm, base deeply heart-shaped with rounded sinus, tip long-pointed, basal veins 5-7, lateral veins 2 or 3 pairs. Flower-clusters are much branched, broader than long, up to 8 x 12 cm, many flowered. Clusters are carried on stalks up to 2 cm. Flower-stalks are 6-8 mm. Sepals are elliptic-lanceolate, about 3 x 1-1.3 mm, tip rounded. 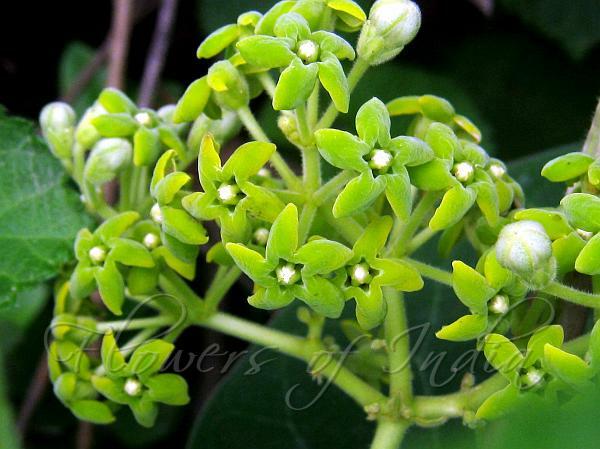 Flowers are greenish yellow, with a bell-shaped tube and spreading petals, very densely hairy on the underside. Tube is about 3.5 x 2.5 mm, petals oblong, about 4 x 2.2 mm, tip rounded, minutely velvety. Corona lobes are protruding from flower tube, oblong, tip truncate-emarginate with corners produced into short horns, sometimes toothed between these. Anther appendages are oblong, slightly longer than corona lobes, pollinia curved cylindric. Stigma head is broadly cylindric, concealed by anther appendages. The stems yield very strong fibers, reputedly among the strongest produced by any plant, that are used for making cords and strings. 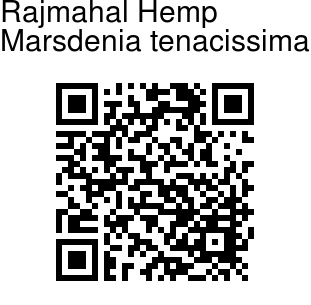 Rajmahal Hemp is found in the Himalayas, from Kumaun to Sikkim, Bengal, Ceylon, Indo-China, W. China, on cliffs at altitudes of about 1500 m.